One night, I had a dream that our entire front yard was in bloom with dwarf irises. Not only were they a carpet of color, but they were blooming in the autumn. It doesn't have to be a dream though, there are many miniature dwarf (to 8") and standard dwarf (8-14") irises that will rebloom in our cold climate zones. 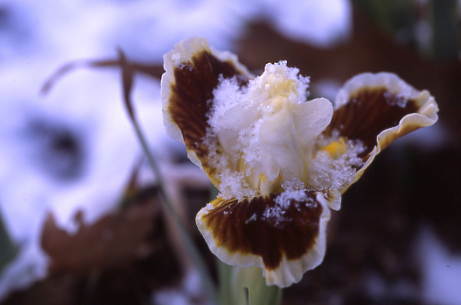 Our garden is located in zone 6b, and many dwarf irises have been reported to rebloom as far north as Canada. Our 'Blue Hues' is a prolific rebloomer for us and even when the temperatures go below freezing it will keep blooming sometime into late December. The dwarfs don't wait until it snows or freezes, they start their rebloom earlier in the fall since their spring bloom is earlier than the tall beardeds. They continue to rebloom until the freezing temperatures last longer than a week. Then they take a winter nap until they awaken in the spring. 'Forever Blue' is another dwarf that reblooms well into the cold season and has been reported to have multiple rebloom in some areas. Chuck Chapman is the hybridizer of this lovely iris and he lives and hybridizes irises in Canada. Working with the blues and teasing out some turquoise, we got this pretty dwarf rebloomer, 'Teagan'. 'Carmel Celeste' is one of my favorite yellow dwarf rebloomers. It was hybridized by Rick Tasco, who hybridizes in California. 'Ray Jones' by Don Spoon is another bright yellow rebloomer that sometimes puts up multiple stalks on the same rhizome and is a prolific bloomer. There are many colors available in the reblooming dwarf irises. Here is one that is green, a newer introduction by Don Spoon, 'Lime Pie' (2017). The miniature dwarfs also love to rebloom in cold climates. 'Sapphire Jubilee' (Ginny Spoon), 'Ditto' (Hager), 'Storm Compass' (Chancellor/Rust) and 'Trimmed Velvet' (Don Spoon) are just a few that we grow. 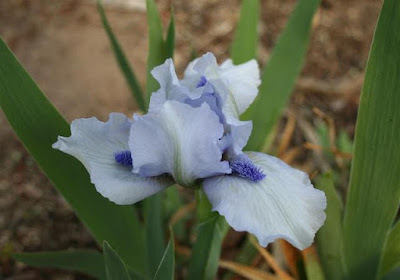 For more information on reblooming irises go to the American Iris Society website: www.irises.org and go to link for the reblooming iris society. They also have a checklist that lists the irises that rebloom and the zones reported for rebloom.